On a recent trip to New York my husband and I decided to try a Lebanese restaurant that I had been following on Instagram. 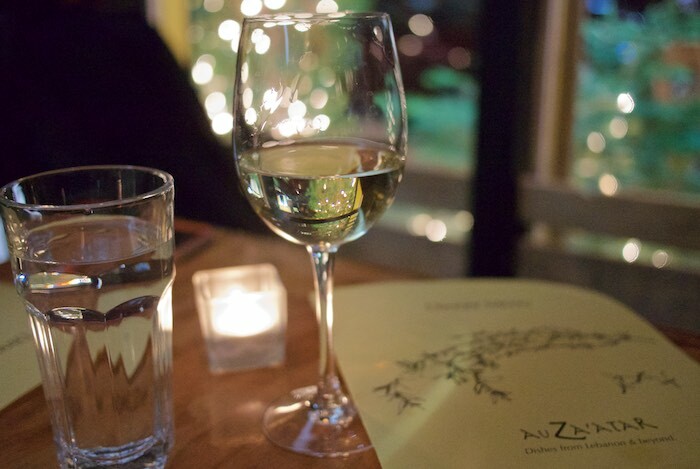 Au Za'atar is a dining destination, in the East Village, serving family recipes from Lebanon and other middle eastern countries. 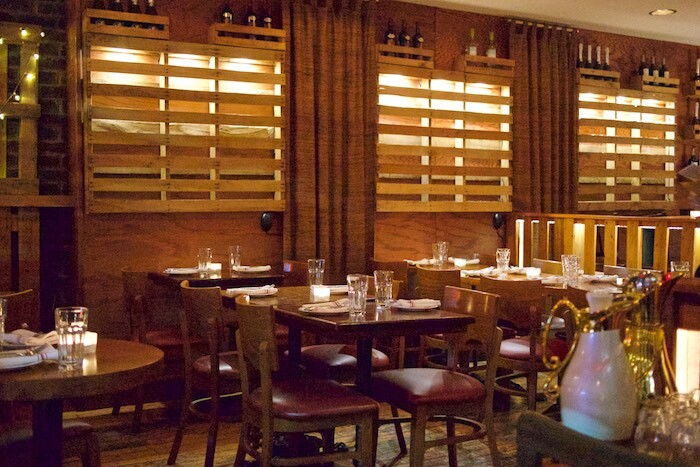 The intimate dining room features an accent wall of exposed brick and lots of dark wood; particularly by the bar, where guests can cozy up to enjoy glass of Lebanese wine or beer. The menu is composed of a long list of reasonably priced mezzes, dips and hearty sharable plates; guaranteeing there is something for everyone to enjoy. Chef/Owner Tarik Fallous takes pride in his restaurant and describes the menu as a collection of the food he grew up eating. 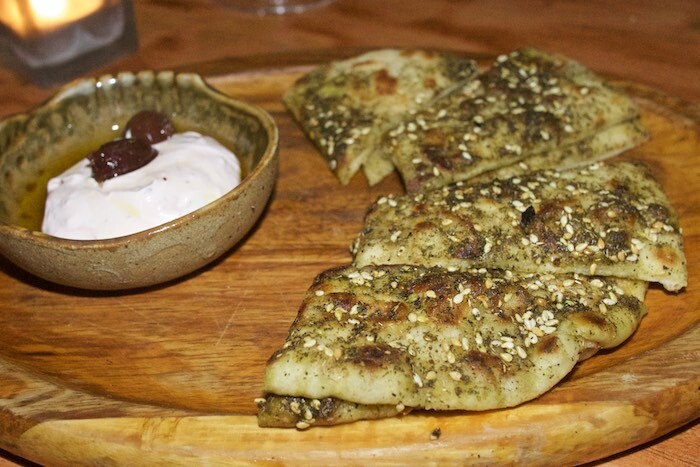 A complimentary plate of Chef Tarik's homemade Za’atar pita makes perusing the menu extra special. For those that don't know, Za'atar is an intensely aromatic and ancient Arabian spice blend used to season everything from grilled meats to freshly baked bread. 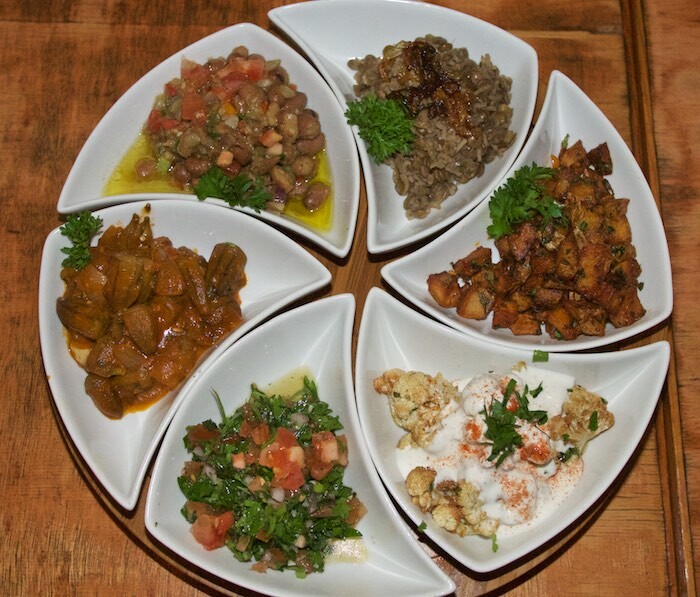 At Au Za'atar it's easy to want to order everything on the menu; making it wise to choose the sampler plates for variety. 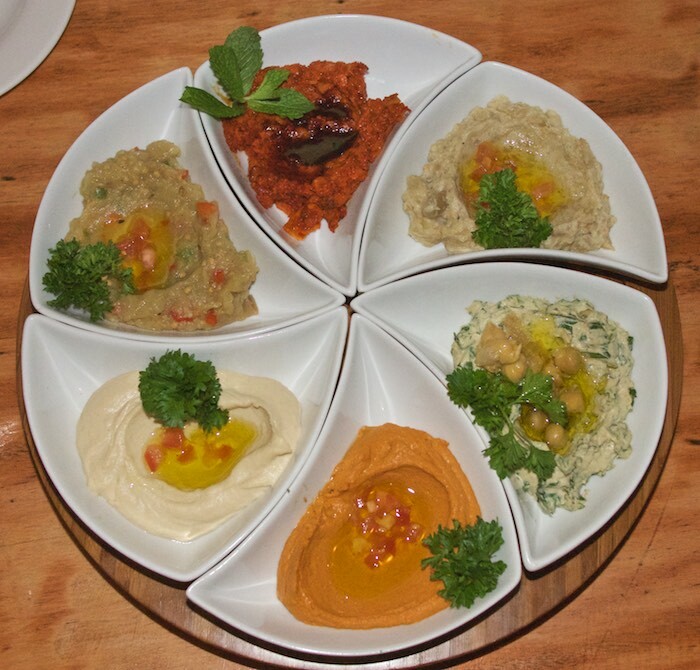 We started our meal with the dip sampler, which included portions of Hummus, Spicy Hummus, Hummus Beiruti, Baba Ghanoush, Saltet Al Raheb & Muhammara. I would not be exaggerating if I said it was some of the best hummus and baba ghanoush I've ever had. Next we tried a mezze tray, which consisted of a nice selection of small dishes: Tabouli Salad, Arnabeet Bi Tarator, Foul Medamas, Batata Harra, Mujadara & Bemieh Bzei. Moving on, we shared the delicious Kafta Bil Sanie, a plate of ground seasoned beef baked with tomatoes & potatoes in a spiced tomato sauce. 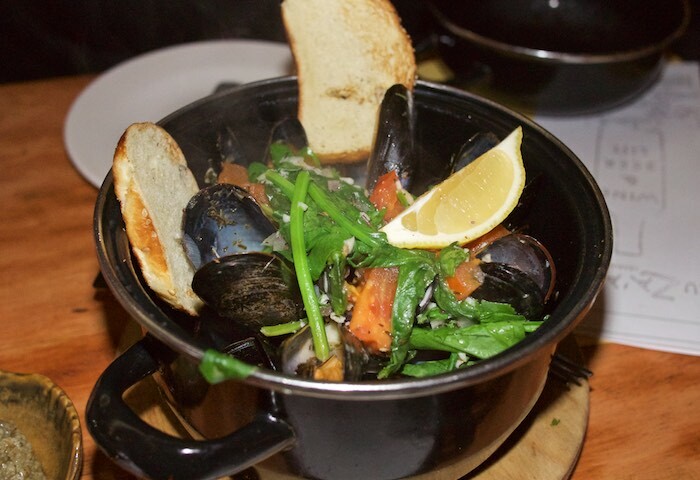 Though the meat dish was fabulous, for those that prefer seafood, the Provencale Prince Edward Island Mussels are a must try. 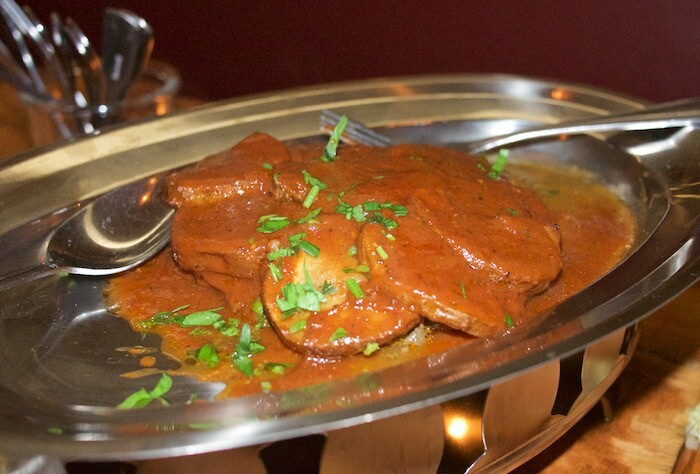 They are steamed with white wine and served with diced tomato, spinach, onions, red peppers & fresh herbs. We finished off the meal with Mouhallabi, a pudding topped with ground pistachios and orange blossom syrup. Chef Tarik also sent us a traditional Lebanese digestive of hot water scented with orange blossom water, called Cafe Blanc. 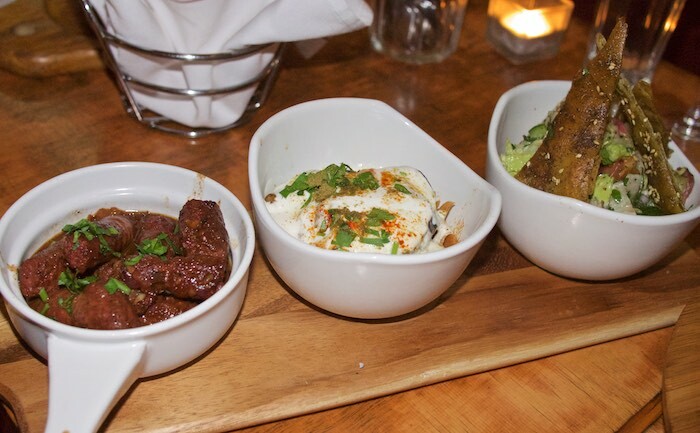 Both my husband and I were very impressed with the food, service and atmosphere at Au Za’atar. It's definitely a restaurant, in the East Village, that should not be missed. Yum, looks like a great restaurant. I'll have to check it out when Im in NYC next time. I love lebanese food! Looks like a great restaurant. I'm heading out to NYC in a few weeks and adding it to my must visit list. Thanks for sharing! Looks like it was quite the feast. Sampler plates are always the way to go. Looks like an interesting place to eat. I have never tried this type of cuisine. Great way to sample some new food. I LOVE Middle Eastern food! I'll have to try this place if I am ever in the area! The food looks delicious! I will definitely have to go to this restaurant the next time I visit NYC. How will I ever keep up! I hear about a new place in the East Village every day it seems. I best get to work.